When life throws us acne scars, don’t break a sweat, the Banish Kit is here to save the day and our skin! Use the Banish Kit to reduce the look of acne scars, and hyperpigmentation. The Banish Kit can also be used on fine lines, wrinkles, stretch marks, body scars and other areas of the body! The Banish Kit is originally created by Daisy, who battled with acne since the 3rd grade. After trying product after product and going to numerous dermatologist visits, Daisy developed the Banish system with her chemist friend. The Banisher was created after consultation with a plastic surgeon friend on the best non invasive methods to help reduce the look of her acne scars. The Banish Oil is a vitamin c serum made fresh to order each day in California. It contains no silicones, dyes, fragrance, or parabens since those items would usually cause Daisy acne. Banisher. You can select either the roller or stamp kit! The Banish Kit is simple to use, time efficient, yet effective to help fade the appearance of acne scars and hyperpigmentation. For just 10 minutes every 2 weeks, the Banisher derma roller and Banish Oil can improve or maintain radiant and healthy skin so you can feel confident in your skin. A great addition into your regular skin care routine. The Banisher has titanium bristles that are the ideal size for at home use with optimum results. The bristles, when rolled into the skin, create micro channels. This procedure rejuvenates and stimulates the appearance of our skin with little to no recovery time. Proceed with the fresh made and natural Banish Oil aka Vitamin C Serum to help even out skin tone, improve skin texture and firm skin. Each kit is inspected for quality before we ship out! Order today and it ships next day! Use isopropyl alcohol (rubbing alcohol) to clean the Banisher. Use the Banisher once every 2 weeks to help renew skin! In most cases, Results can be seen within 4 to 8 weeks of consistent use - or even sooner! 1 year after Banish Kit on Asian Skin. We use vegetable glycerin instead of filler chemicals. Vegetable glycerin helps seal in the moisture in skin! Banisher Roller - Recommended for those who want to reduce the appearance of textured skin, and reduce the appearance of blemishes. Use once every 2 weeks Can be used on face or body. Do not use over active breakouts. We recommend replacing the Banisher after 3 to 4 uses to prevent bacteria from building up on it, but it is up to your discretion when to replace. Banisher Stamp - Does all the same things as the Roller, except it's pen shaped to stamp AROUND any breakouts. Use once every 2 weeks. Do not use over active breakouts. 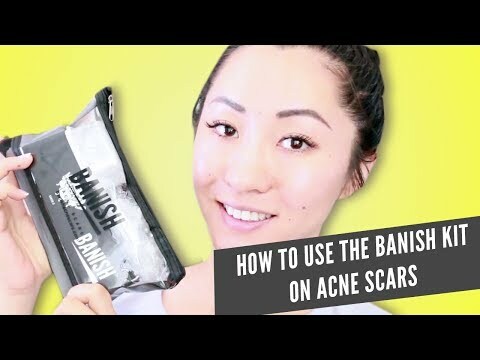 Do not use Banisher over Active Acne. Use Banish oil daily or every other day for best results and avoid sun exposure while using the Banisher. Consult with your dermatologist before use if you are or recently were using a prescription based acne cream or medication. Abit of mistake at first by receiving the wrong product but explained to the customer service team and got what I needed and recieved in just under 4 days I must say your delivery services are outstanding!! All the way from California to South Wales UK 🇬🇧 outstandinding packaging and amazing products great customer service also no feed back on the equipment it’s self yet as I’ve only now started using it but it will I obviously be amazing like you guys! Honestly tho great work guys! I’m one proud happy customer I’ll be back for a review for the banish kit don’t you worry. It has been almost two months since i order my first banish kit, and i can already see a big difference in my skin. The most important thing to understand if it works for you or not, take before after pics! Because the process is taking time and you have slight improvements everyday, you don’t understand the difference when you look at the mirror at first. But when you put your before and after pics side by side, you see the HUGE difference and improvement. Thank you so much!!! Trying to live my best life ! These products are amazing ! My face feels instantly soft and hydrated. I’m trying to work on scarring and big pores but slowly but surely my makeup is laying nicer and the texture of my skin is smoothing out. Totally worth it !